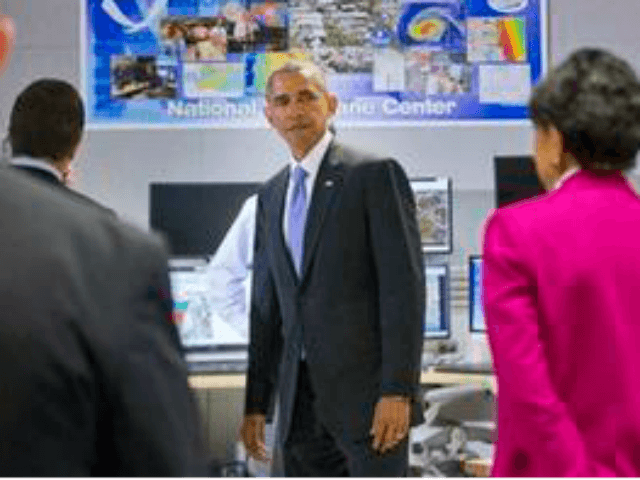 At the National Hurricane Center in Miami, President Obama warns that the United States needs more preparedness for the extreme weather fueled by climate change. “The best climate scientists in the world are telling us that extreme weather events like hurricanes are likely to become more powerful,” he said, adding that stronger storms and higher sea levels were a recipe for disaster. During his remarks he asserted that climate change had “significant effects” on making storms worse. “Climate change didn’t cause Hurricane Sandy but it might have made it stronger – the fact that the sea level in New York Harbor is about a foot higher than a century ago certainly made the storm surge worse,” he warned. Obama called for Congress to focus on a bipartisan commitment to building “resilience” to the changing climate through infrastructure spending.